Exactly where you're supposed to be. I’ve been telling myself this a lot recently, ‘you’re exactly where you’re supposed to be.’ It really started in November with that unbelievable Oregon sunset (this one here). It’s a notion that’s been continuing ever since, mostly signaling itself through natural events, like sunsets, sunrises and moonscapes that are so beautiful I can’t help but be anywhere but exactly there, exactly where I’m supposed to be. Let me explain. My airplane was in a rainbow-shadow bubble!! So cool! On December 3, I boarded a flight to Vancouver BC, and then another to Frankfurt, and then a third flight to Marrakech. I’d only planned this trip about 15-20 days before; when the opportunity came into my world to visit a dear friend and do some work. It was an opportunity I couldn’t pass up, and ultimately one that couldn’t have happened at any other time in my life. Things were shifting in my life pretty quickly, following my newly minted single status, and a letting go of a lot of resistance I had related to life outcomes. It became so clear to me that when you remove obstacles, that space can be filled with good things. Poet Kahlil Gibran said, “The deeper that sorrow carves into your being, the more joy you can contain.” This was happening for me; a freshly cleared out space ready to invite in the joy – all the joy – all the things. Vancouver BC has a nice spot for a 3-hour layover. 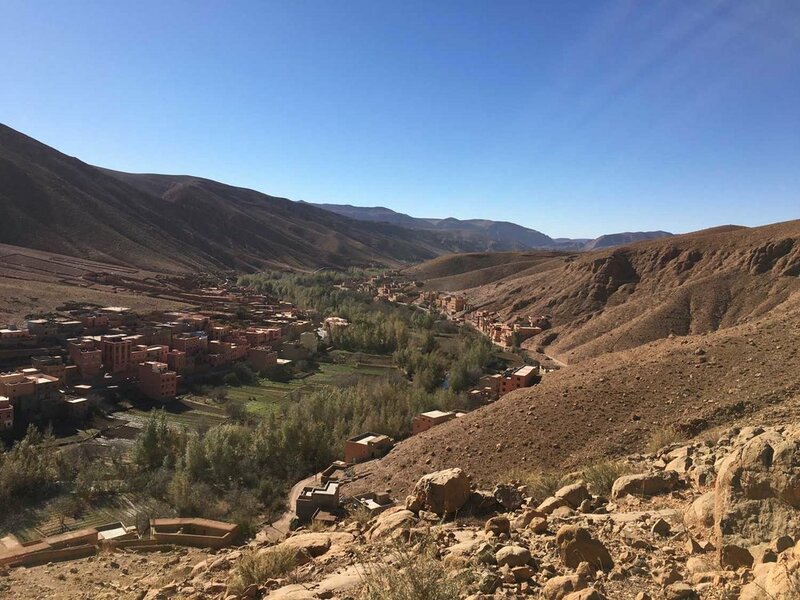 So I got to Marrakech, was greeted by the kind Jamal, taken across town (after 4 separate stops at ATM’s cause my card wouldn’t work – minor panic moment), and dropped off at the CTM bus station to await my 5-hour bus ride over the Atlas Mountains and the Tischka pass (at 7,700ft), which would drop me off in the town of Ouarzazate (home to the filming of Gladiator, Game of Thrones and Lawrence of Arabia! ); in time for one final driving leg of 1.5 hours until I got to my destination. I boarded that bus, took my seat, and remembered the last time I took this ride 4.5 years ago. It was mid-morning. The bus was packed, every seat taken. Back then, during that first trip, we climbed the hills, and up the winding roads to the Tischka, made our way down and a bus load of exhausted, hot, and many of them car sick, people got out in the dusty film town. This time the bus left at 5:15pm and there were only 7 of us. It was quiet, and the sunset, though hazy, cast a pink glow on the mountains that rise up behind Marrakech. As we made our way out of the city, I watched it change from dense, to suburbia, to groves of olive trees and finally to an incline into the mountains dotted with houses and villages. It was dark by the time we started climbing but I continued to stare out the window, willing my eyes to see the scenery and register how it might have changed or looked the same since my last trip. The entire time I kept seeing a bright light beyond the mountain ridge and I kept thinking, “Wow, I don’t remember Ouarzazate being that big of a town that it could throw off that much light!” It was soon that I realized it wasn’t light pollution; it was the full moon making its rise over the ridges! Duh. We made our first stop for restrooms and snacks, and continued on our way. I put in my headphones, and started to doze off to sleep. But we turned a sharp corner, one of many twisty turns on the narrow road up to the pass, and I opened my eyes and saw the full complete moon, having just risen over the top of the mountains, shining brightly like a Batman-style floodlamp. I immediately started crying. We were climbing so high, and the moon was so low, I thought I could just reach out and touch it; it was there just for me. And you know how when you’re out in the mountains, looking out and you can see the shades and layers and varying colors of the ridges? I saw that, but the mountain ridges were bathed in moonlight. And in my ears Natalie Merchant (I was on a Natalie Merchant kick, k?) was singing, “Oh I need the darkness, the sweetness, the sadness, the weakness. Oh I need this.” Oh did I need this. 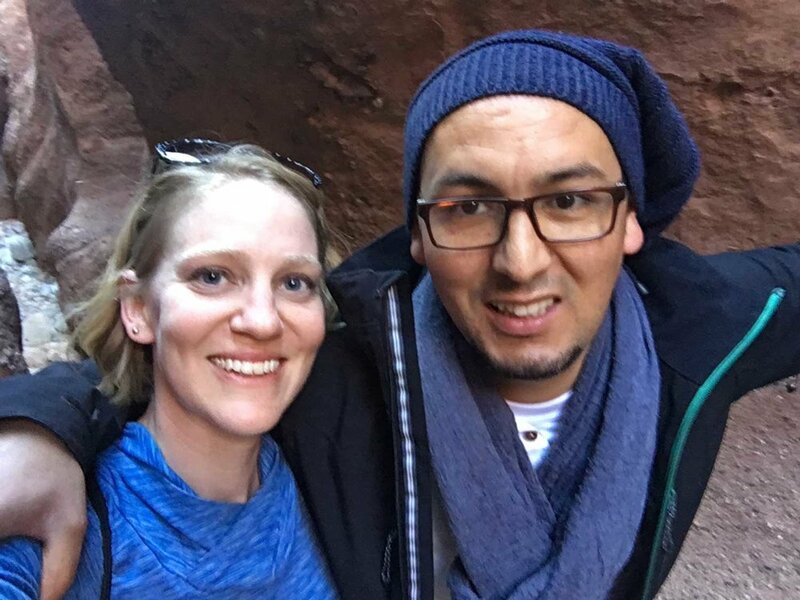 In that moment, I knew that I was exactly where I was supposed to be: on a bus, at night, climbing high into the Atlas Mountains of Morocco, with 6 other humans (7 including the driver). I told myself how proud of me I was, how much I loved me for taking this journey, for stepping out into an unknown and doing this, how god/higher power/the universe was right there with me in that moonlight, and that there was nowhere else I should be, it was all right there, I had everything I needed and more. And then, a half an hour later I saw a shooting star. A shooting star on a full moon night!!! WTF as if it couldn’t have been any clearer. Pure magic. Most of my moments in Morocco were grounding in this way. 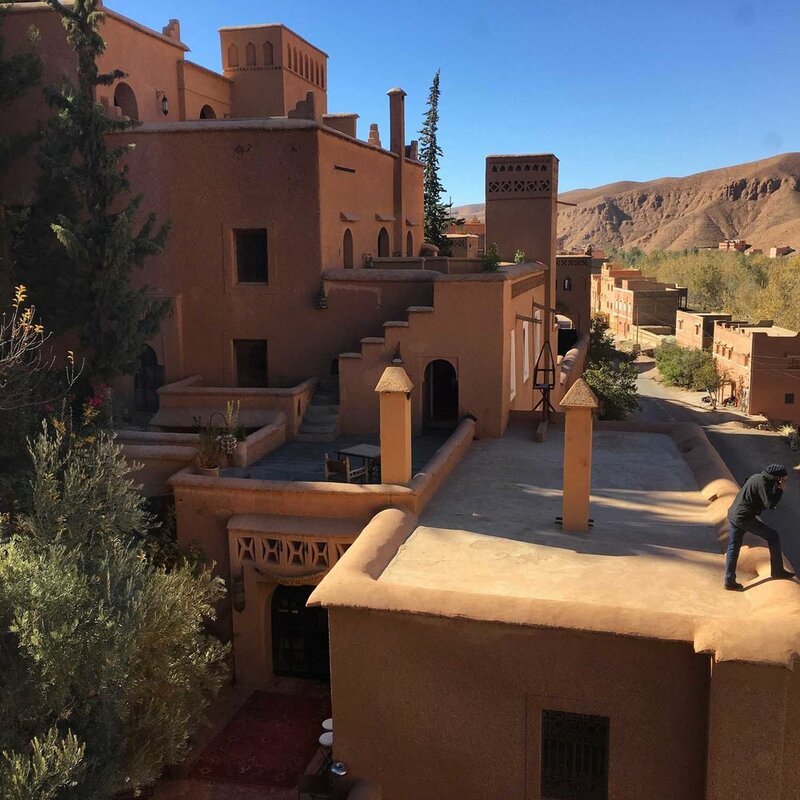 In fact, despite my worry of the effects on my often-sore neck due to the long and uncomfortable travel, I was blissfully pain-free the entire time I was in Morocco. I believe this was a pretty clear indication of being in the right place. 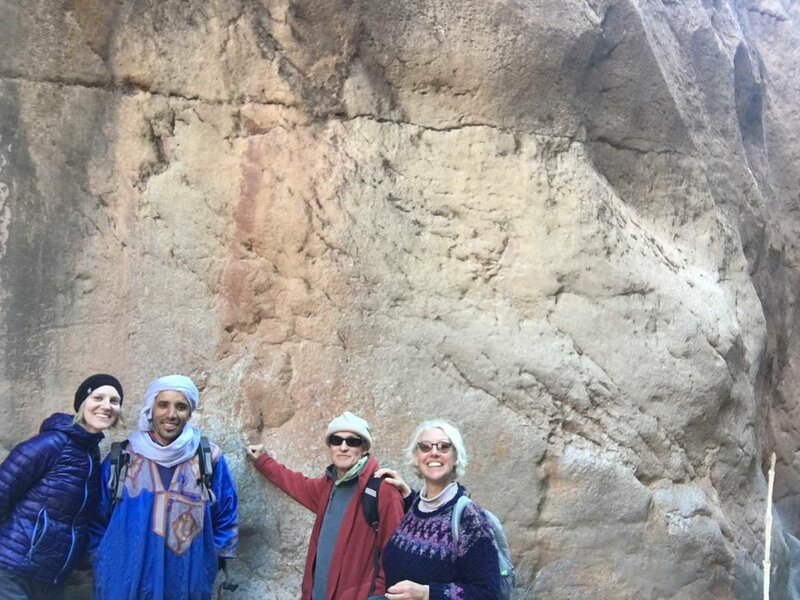 And every moment I shared with new friends having tea by a wood fire, or making an attempt to learn some Berber phrases, or going for beautiful hikes in the surrounding area – it all reminded me that I was exactly where I needed to be. I think this is called serenity, no? We search and search through jobs and money and things. But for me, it was the work of removing my own resistance to my pain, allowing it to move through me, and then creating space for the joy to stick to that residue – the residue being that tacky honey that is our lived experience and only makes us more human, more real. Invite the pain and the lived experiences in, as Gibran said, they’ll only create more space for joy; for what we have to be enough. I don’t want or need a lot, just enough. I’m not saying it was all perfect. That’s not really a thing in my book, but it was what I needed. And despite my sadness around leaving, the deep orange and red sunrise that silhouetted the M’gouna mountain range in a stark black-on-red contrast, also told me that it was okay to leave, that even though I didn’t want to, it was time, because I had to go do the next thing. It told me that inshallah (god willing), I’d be back. It told me, take this picture with you; you won’t forget it so you don’t need to resist what’s coming your way. It’s ok to keep moving. That next thing had me fly back to Portland, stay a day and a half, and then fly to New York City. Not only did Portland give me a spectacular sunrise with a clean outline of Mt Hood and a waning crescent moon outside of my airplane window, I arrived in New York on December 14th, and while in the car driving into Midtown, witnessed another stunning sun-event. Not one that silhouetted mountains, but one that shone light on Manhattan, as if to say, “Welcome, we’re glad you’re here.” It felt right. Much like the moonrise, I knew I wasn’t meant to be anywhere else but in that car, headed into town. You see, that November Oregon sunset felt like a goodbye for me and this was hello. In all my time in Oregon, I’ve never seen a sunset like that; and to witness one like that, in November, at the coast, is a rare and beautiful thing. Oregon gave me a moment to thank it for 17 years, and it gave me another piece of its beauty I’ll take with me. So what’s the deal? Why the goodbye? I’m pleased and also sad to share that I snuck off to NYC for a job interview. It’s a job that I was offered, and have formally accepted! I’ve been hired as the new Private Sector Initiatives Manager for Americans for the Arts, in their New York office! It feels right, and exactly where I need to be. I have no idea what I’m getting into; heck have no idea about a lot of things, but much like stepping on to those airplanes and buses in Morocco, I’m letting the universe take me on this adventure. It feels good. It feels, as in my last post, creative, resourceful and whole. So what does this mean? I’ll be moving to New York in a few short weeks, starting sometime between January 22-February 1! It’s going to be a fast turnaround, but after so much time searching and being lost, life can’t wait. We used to read at the end of every summer camp session that ‘every ending has a beginning.’ I’m ready for this new beginning, and am relishing every moment of this ending. Also I need help! If you have housing suggestions, thoughts, ideas, solutions or whatever, send them my way! And thanks to my sister from another mister, Kimberly, for sending me this video directly after learning about my move, it made me pretty excited about what's to come.